Winger Rick was signed by Steve Harrison in 1988 as Watford unsuccessfully tried to avoid relegation to the Second Division. He played a prominent role the following season as the club tried to gain promotion back to the First Division. After losing his place, he moved to Oldham Athletic early in the 1989-90 season. 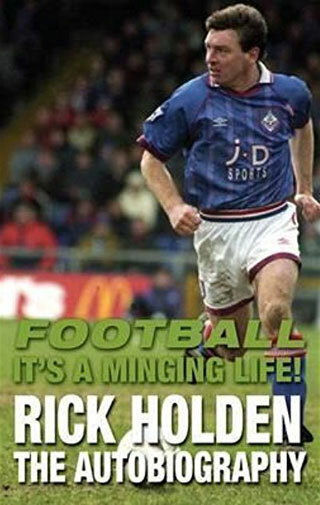 Rick released his autobiography, “Football, It’s a Minging Life!” in 2010. He now works as a physio on the Isle of Man, and spoke to Watford Legends in 2010. Hi Rick. Thanks for talking to Watford Legends. How did you become a Watford player? It was Steve Harrison who signed me. He was a northern lad himself and wanted to bring me down to Watford. Steve wanted to get someone in to play on the left as they hadn’t replaced John Barnes. So Watford put in the offer to Halifax and it was accepted. Was it much of an upheaval to move down south? No not at all because I’ve got relatives in Hemel Hempstead. So it was a home from home really. Did you settle well in the team? They were a good set of lads but they had lost their way a little bit. I couldn’t really understand why as they were good players. But yeah, they made me feel welcome and I got on with them all well and enjoyed being in that side. With the club you played one full season. Was there a particular moment that stands out for you? Not really to be honest. I know I chipped in with a few and actually in the season I was at Watford I enjoyed creating a few as well. I think I scored a good goal against Arsenal though. We were going great guns and looking like promotion candidates. But I think Steve toyed around with the team a bit much and I found myself not involved in the last few games, including the play off games against Blackburn, which we lost. I think Steve would be the first to admit that he over-tinkered with the team in the end. Why were you not involved for the run in at the end of the season? Steve was one of those managers who would not explain too much his decision to drop you. He and I had a run in during a game at Bradford City. We were one nil up and he took me off and put Kenny Jackett on in my place and I didn’t really understand. The Watford supporters applauded me and I applauded them back as I left the pitch, but then Steve and I were swinging punches at each other in the dug out! It continued on the bus on the way home and we both told each other we were disappointed in each other. Do you get on now? Yeah there’s no problems. I was an experienced player and he was an experienced coach/manager. So we were both passionate about the game and in a way its pleasing that we both had some passion for what we were doing. So when the time came to leave was that your reason to leave? Or was it that you wanted to get back up north? No not at all. During the pre season he’d put me in the side and left me out, so I didn’t really know what was happening. Steve was good to me because I was going to hand in a transfer request and he told me to keep it in my pocket because Joe Royle had been on the phone looking to talk to me at Oldham. So off I went. Do you regret not playing more seasons for Watford? I would have like to have stayed longer. To be fair to Steve he built a hell of a squad. Names like Dave Bamber, Glyn Hodges and Willie Falconer. There was also Tony Coton and Luther. Going to Watford was the making of me because I proved to myself I could make it as a top pro. It helped me when I went on to Oldham. But I did regret leaving my mates at Watford. So what is the day job now? I’ve run a physio business for a few years and every now and again l’ll dip in to professional football when asked. I was assistant at Barnsley for a couple of years as well. Peel is my base and I also run Peel FC on the Isle of Man. It’s also where my kids are. Its a very enjoyable way of life. Would you like to get back in to the pro game? I think it would have to be a ridiculously good offer. I don’t really like the cut throat mentality of football now. Clubs will get rid of the manager and backroom staff at the drop of a hat. I think clubs feel the need to win trophies and leagues too quickly. But when the kids are a bit older I might go for it. I’m still only 45 so I have a few years to go yet! Well keep enjoying what you’re doing! Cheers lads Thanks very much. Old stuff like Blackadder and Morecambe & Wise. New stuff is crap!